The Celtic Manor Resort is enormous and has an impressive repertoire of facilities. These include two spas, two health clubs, two main hotels, three world class golf courses, a shopping centre, extensive conference facilities and a hairdressing salon. There is a strong emphasis on family fun too with an equally impressive range of indoor and outdoor activities for all ages. Bursting with revitalising treatments, super chilled relaxation spaces and delicious food for the soul, a visit to The Forum Spa is designed to make you feel fantastic. Refuel, recharge and re-energise with our delicious spa lunch bursting with wholesome, healthy ingredients. The enormous Celtic Manor Resort has impressive facilities. 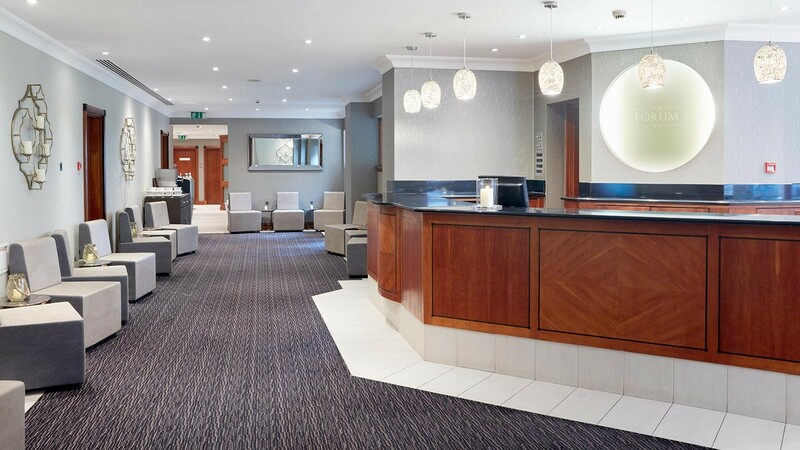 These include a spa and treatment rooms, two health clubs, two hotels, three golf courses, a shopping centre, extensive conference facilities and a hair salon. There is a strong emphasis on family fun, too, with indoor and outdoor activities for all ages. From the huge central hotel reception, you can reach the health club and spa via the central staircase or taking the lift. The Forum Spa lies behind huge wooden double doors. The spa reception area is light and bright, with sparkling shelves of products, flickering candles and pendant lamps over a curved desk. Staff welcomed us with a hot flannel, and tea and shortbread while we filled in our consultation forms, then took us on a tour of the spa. The Forum Spa changing rooms are shared between the spa and the health club, but they are spacious with banks of wooden lockers and a mosaic-tiled floor. They were kept clean and tidy during our visit. If you visit for a spa day, you will find a fluffy robe, towel and slippers in your locker. Two vanity bars have hairdryers as well as cotton buds and pads. Both male and female changing rooms have a wet area with a steam room, a small sauna, which was nicely hot, and large Jacuzzi. In keeping with the name of the spa, there is a Roman theme to the décor: the walls are adorned with fabulous Romanesque murals. The pool area is bright, with floor-to-ceiling windows which look out onto beautifully kept gardens, giving the place a lovely atmosphere. The main pool is long enough for a decent swim but also has seated side areas with water jets. Next to it is a separate small children's pool and a huge bubbly spa bath; you could get 30 people in here. The pool is watched over by lifeguards. Although the pools can be busy at times, there are plenty of poolside loungers for relaxing. If the weather is clement, there are also loungers outside in the gardens. What adds to the lovely atmosphere is the ceiling above the pool; it is domed and painted with a cloudy sky. You can swim on your back and pretend you are outside without any disadvantage of actually being rained on. At night, the "sky" darkens and lights twinkle like stars. There's also another sauna at the side of the pool, which is fairly large and nicely hot, so you can do your warming up and cooling down here, too. As the pool is also part of the health club, there aren't stacks of towels in the changing rooms or on the pool sides. But if you ask at spa reception, they provide you with a fresh towel whenever you need one. The Forum Spa has 16 treatment rooms and two relaxation rooms. The larger of the two is a sociable space with 12 loungers adorned with soft brown throws, and tall windows looking out across the grounds. There are plentiful magazine options should you want to read and relax. If you prefer complete tranquillity, there is a smaller, much darker, relaxation room. We had the Elemis poultice-powered muscle release massage (50 minutes, £74). Jane, my therapist, took me through to the treatment room, where I lay face down on the wide and heated bed. She started by uncovering the left side of my body then the right, and massaging my arms and legs with the heated poultices and warm oil containing almond. The poultices contain amber and quartz crystals, and it was surprising how deep into my muscles they could reach. Jane turned her attention to my back, neck and shoulders, focusing on my tense neck, as requested, and using tiny poultices to ease the stress. I turned onto my back and Jane massaged the front of my arms and legs. The poultices felt particularly comforting on the palms of my hands and the soles of my feet. A highlight of the treatment was a deeply soothing scalp massage; Jane not only worked across my scalp but also up into my jawline and across my forehead. Bliss. This nurturing massage would be ideal for anyone feeling a little fragile or in need of support. Poultices are especially calming: you get all the heat but none of the noise that hot stones often make. I returned to the relaxation room feeling very rested. The Forum Spa uses Elemis products for all spa treatments. Choose from a range of treatments for men and women, including facials, massages, wraps and scrubs, relaxation and detoxifying rituals, and treatments designed specifically for men and mums-to-be. At the Beauty Bar, you can book in for manicures and pedicures, while the Rhys Giles hair salon means you can go home looking picture perfect, too. Spa-goers can dine in the Forum Café, next to the spa, where you can feel quite comfortable in your robe. Our buffet lunch included two choices of soup, a range of salads, proteins such as chicken and fish, as well as vegetarian options. Everything was nicely set out with impressive information cards by each dish for those who need to avoid certain ingredients. We enjoyed the fact that we could help ourselves. The parsnip soup was warming and spicy, while the salads tasted fresh and zingy. You could also order inventive smoothies, teas and Prosecco. Later that evening, we went for dinner in Rafters, the golf clubhouse built when Celtic Manor hosted the 2010 Ryder Cup. A driver had to take us there in a car, as it is a little far to walk, but this gave us an opportunity to enjoy the green views and the setting sun. The modern building is certainly impressive, and the menu equally so, highlighting fresh grills and fish but also catering for vegetarians; our twice-baked cheese soufflé was delicious. We enjoyed the treat at the end of a relaxing spa day. Our treatment: The massage was professional, personalised and powerfully relaxing. Sipping a glass of fizz in the relaxation room and enjoying the wide-ranging views. We wish we'd had more time to get involved with the gym and classes available -- next time. The changing rooms can feel busy at times. 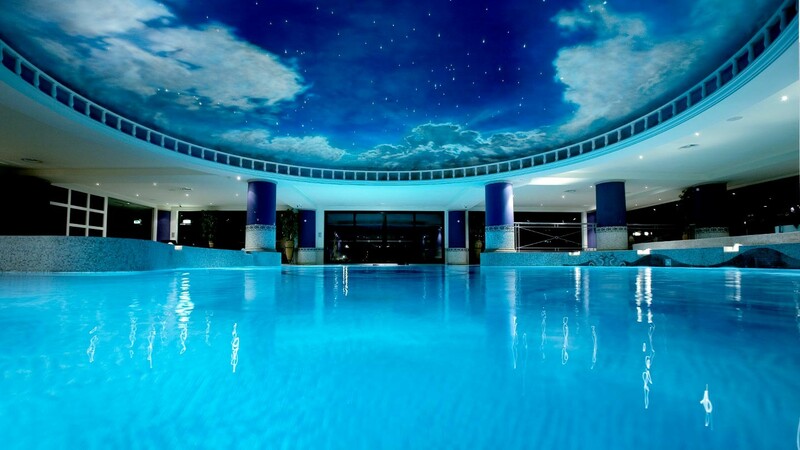 Families: The Celtic Manor Resort comes into its own as a family hotel, but you can time your spa treatments and children's swim times so they don't coincide and you can all come home happy. 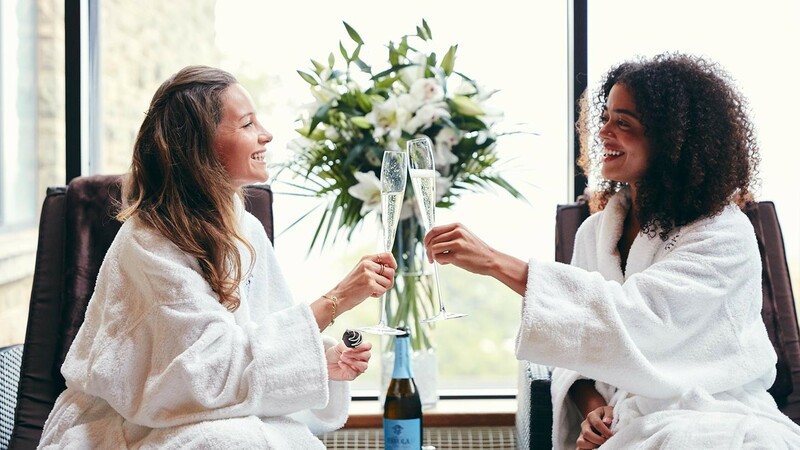 Friends: If you're here with a friend for a spa day, the mix of facilities and treatments gives plenty to choose from, with various social spaces to chat. 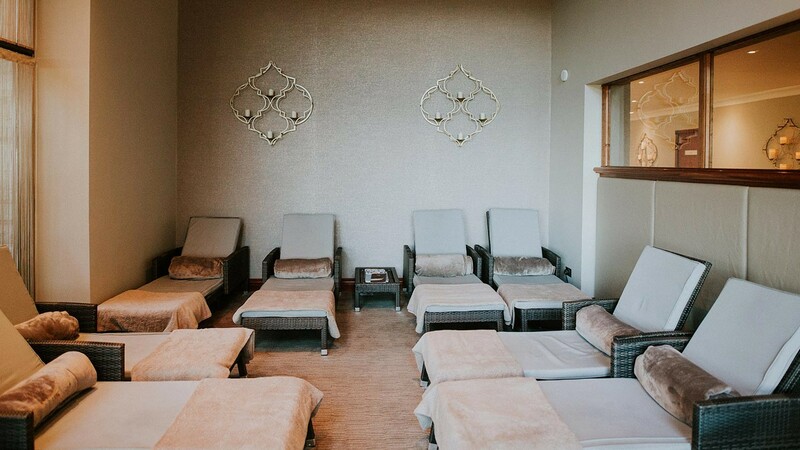 We gave the Forum Spa at Celtic Manor Resort a Good Spa Guide Bubble Rating of 4 Bubbles for their first-class treatments; great customer service; and fresh, healthy food. The facilities are extensive enough to keep you happily engaged on a spa day. The pool offers a great swimming atmosphere, and you can make the most of the gardens in sunny weather. Some of the facilities needed maintenance or TLC on our visit, so this kept the spa away from the perfect 5 Bubbles. However, the Forum Spa is still a great place to refresh, recuperate, or relax. There are seven restaurants, six bars and The Forum Cafe. Dietary requirements are catered for wherever possible. Spa Lunch - Fill up on superfood salads, power proteins and wellness carbs, washed down with one of our reviving super smoothies, or a cheeky glass of bubbly. Forum Café – Light bites, sandwiches, paninis, jacket potatoes, smoothies, cakes, coffee. This light and airy café located on our Health Club Level offers soup, sandwiches and jacket potatoes for those in search of a healthy snack, and a tempting selection of coffee and cakes for those who aren't. There are 589 rooms across four hotels and ten luxury lodges. There is a supervised childrens club. The spa is within the resort hotel, with the Manor House hotel within walking distance. Lodges are onsite and accessed by a complimentary shuttle service. Pay and display parking at 3 onsite car parks, 3 hours complimentary then it becomes chargable. The nearest train station is a 4 mile/10 minute drive. There is a taxi callout service - please ask at reception. There are treatments for people with disabilities and wheelchair users, and the spa is accessible with a pool hoist. The changing rooms are limited space.